We all want a happy, friendly Labrador puppy. One who greets everyone and everything you might come across with confidence. Fearful dogs are unhappy dogs, who are more likely to be aggressive as a result of their worries. 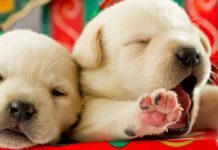 [wp_ad_camp_5]To give your puppy the best chance of developing into an outgoing and cheerful dog, you will need to spend some time on puppy socialization during the first few weeks that he is with your family. In this article we will look at what puppy socialization is and how to socialise a puppy. 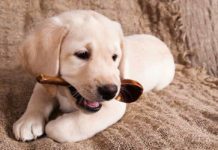 Giving you lots of helpful information on how to make the best use of your puppy socialization period, puppy socialization classes, and providing with a handy puppy socialization checklist. 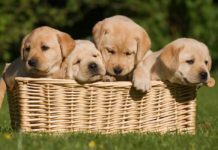 Puppy socialization is the process of familiarising your new dog to a variety of experiences, people and scenarios that he might encounter as an adult. It is an important process, which will help your small puppy to grow into a confident and friendly dog. The window for puppy socialization is very small. It is closing fast at fourteen weeks of age and is almost certainly closed by the sixteenth week. You need to act fast. 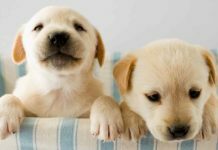 What Is The Puppy Socialization Period? The ideal puppy socialization period is between 8 and 16 weeks go age. During this age your puppy has what is known as a socialization window. A period of time when they have little fear of new experiences and will widely accept anyone new. This window closes because your puppies ancestors would need to become wary of strange experiences in order to stay safe. Why Does The Puppy Socialization Window Close? In the wild, our dogs’ ancestors inhabited a dangerous and uncertain world. If small puppies went wandering about in the vicinity of larger predators they wouldn’t last very long. 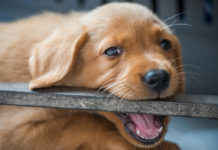 Once they leave the safety of their den and venture out in the wider world, puppies need to keep away from strange and potentially dangerous objects, animals and experiences. Nature ensures that they do this by providing an instinctive nervousness of novelty. Most wild animals have this neophobia to a greater or lesser extent. If a puppy is kept shut away from people, cars, dogs and other trappings of the modern world until the socialization period has ended, he will most likely be a fearful dog. [wp_ad_camp_2]He may be very fearful indeed. Such dogs can be helped, but it is a longer and slower process. 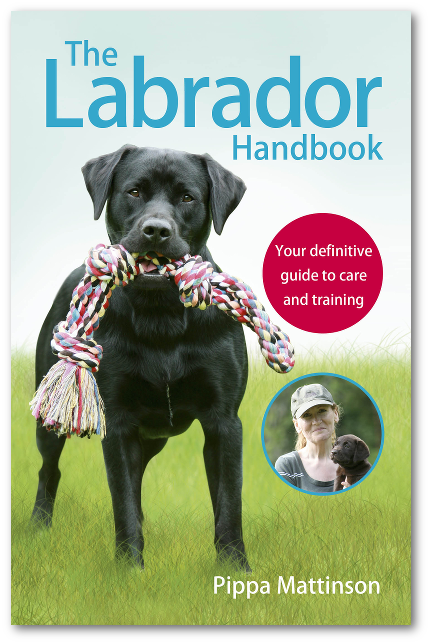 If your dog is an adult Labrador requiring further socialisation, check out our Socialising An Adult Labrador article. Of course most puppies are not shut away like this. They are raised within a family and grow to accept many new experiences. Using the window of socialization means that for a few weeks after bringing your puppy home, you will need to arrange your life in a way that ensures your puppy is exposed to all sorts of people and places. Your objective is to expose your dog to a wide variety of normal everyday occurrences that he would not be exposed to if he spent his first sixteen weeks alone at home with you. The easiest way to achieve this is to list the main categories for socialization, and ‘check off’ as each one is encountered and accepted by the puppy. Some things, which he finds scary, will need to be revisited until he is comfortable with them. Socialization can be divided into two phases: pre-vaccination, and post-vaccination. Until your puppy’s vaccinations are fully effective, you will need to keep him away from other dogs whose vaccination status is unknown. You will also need to keep him away from anywhere that such a dog may have used as a toilet. Your puppy will therefore need to be carried in your arms in any public area. To find out more about when it’s okay to let your puppy out on ground level, check out our When Can I Take My Puppy Out article here. Unfortunately the countryside is also hazardous as foxes and rats can carry fatal diseases, from which your puppy needs protection. Therefore, the rule is carry him, until his vaccine status is at maximum. Your vet will tell you exactly when this is, but usually it is one week after his final vaccination at about 12 weeks old. As you can see this leaves very little time for the post-vaccination socialisation phase. This is an important time to get your puppy used to car travel as you will be going out and about with him frequently. Don’t worry if he is sick for the first few journeys. Simply avoid travelling after a meal and the sickness will normally pass within a few days. Check with your vet if carsickness persists or you are concerned. These are the main categories to which you should socialize your puppy. Some of the categories overlap so that you can ‘kill two birds with one stone’. If you can make a real effort to ensure that your dog is comfortable in each category, he is highly likely to grow up confident and friendly no matter where he finds himself in later life. 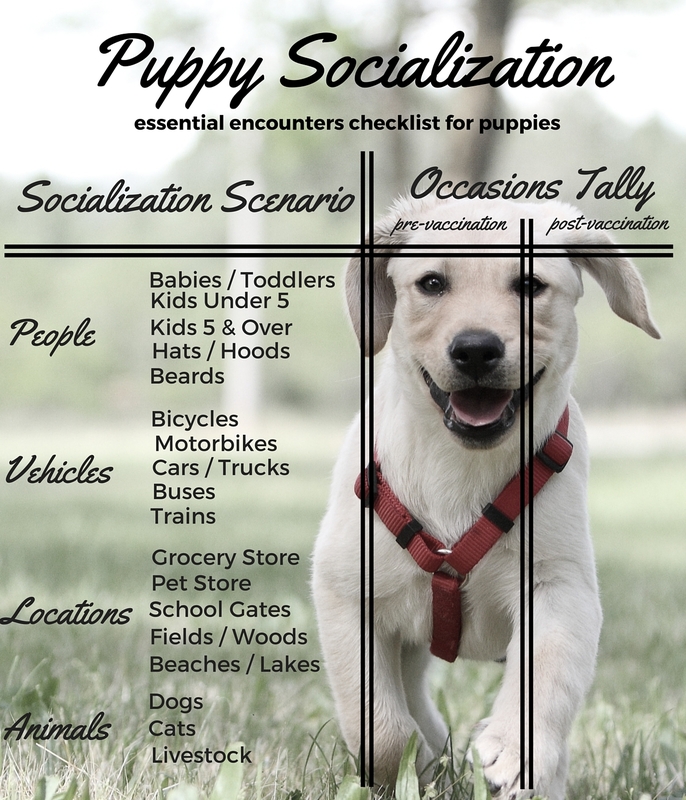 Your puppy socialization checklist is separated into two columns. One for before he has finished his course of vaccinations, and another for afterwards. Print out your checklist and stick it to your fridge. On each occasion that your puppy encounters one of the described scenarios, put a tally into the relevant box. Try and have ten tallies for each item, in each column, by the time your puppy is 16 weeks old. The tally must be based on number of occasions, rather than the number of people met in one occasion. For example, you must meet babies on ten different days, not ten different babies at one event, in order for your pup to become familiar with them. You can however encounter several of the items during one occasion. So each time you go into town, you might be able to put a tally mark under bus, train, car and motorbike when you get home. If you have any questions about using your checklist, please pop them into the comments box at the bottom of this article so that we can answer them for you. It is very important to ensure that your dog is well socialised to all different kinds of strange people. Just because your puppy has met lots of your adult friends, does not mean he is well socialized. He needs to meet people of different sizes and of both sexes, people in a variety of different clothing (uniforms, casual clothes, reflective gear, motorcycle helmets etc). Most importantly of all, he needs to meet children of different ages. Very small children move differently and sound different from older children and adults and they also behave unpredictably. Make sure your puppy is not nervous of children of any age. Lorries and buses, cars and trains, bicycles and clanking dustbin lorries, noisy tractors and motorbikes. Your dog should be comfortable in their presence. A town centre will expose your pup to most of these things in one go. Standing outside your local supermarket with a puppy in your arms will quickly introduce him to a wide variety of people. 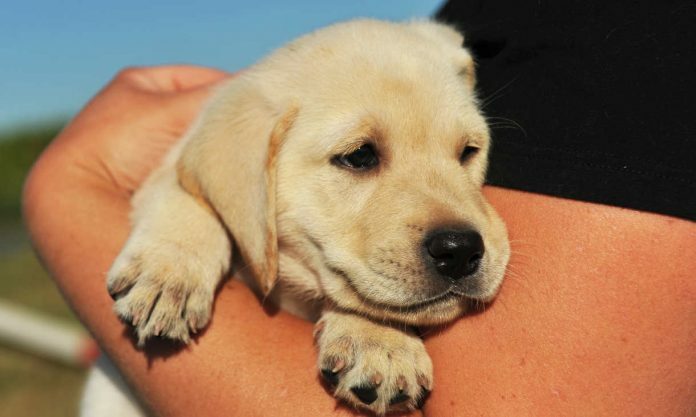 Labrador puppies are ‘people magnets’, and you will be surrounded by admirers within minutes. Visit your local school gates at the end of the school day and he will meet lots of children. A trip to the railway station is also an interesting and useful experience for a puppy. The high street of a busy town should be included, and if it is summer, you will be able to take the pup to some summer fairs or shows. In the countryside, you can visit fields and wood, rivers and ponds. He will learn to clamber through mud and leaves, heather and bracken. Try to explore different types of terrain and unless it is very cold, introduce your pup to splashing about in water. Puddles first, then shallow streams and ponds. Getting him swimming about happily now will stand him in good stead later. Most of this will need to take place post-vaccination. If you have opportunity, you can introduce your puppy to livestock in a very controlled manner. He can look at some cows or horses from your arms. The objective is not to train him to behave amongst them, that comes later, this is just to ensure that he is not afraid of them. Most important of all is your dog’s ability to get along with other dogs. Although dog-to-dog socialization is very important, it is also important for you to remember that you cannot predict the behaviour of other people’s dogs. Don’t be in too much of a hurry to introduce your puppy to stranger’s dogs, as a bad experience can have long lasting effects. If you have a friend with a very friendly, not too bouncy, vaccinated adult dog, then introduce them by all means but supervise closely. Even the nicest adult dogs can find other people’s puppies a ‘bit much’. Some dog trainers run puppy socialization classes for small puppies who have had their first vaccinations. If you can join a good class like this, it will help socialize your puppy to other puppies. Try and find a class that a friend has recommended as standards vary, and sufficient supervision should be available. Puppy socialisation classes are designed to help your puppy become confident around other dogs and people. And they can definitely help with this. But it’s important to remember that they are not a substitute for getting out on your own. The range of people in your puppy socialization classes will be small. The same people will probably come each week, and you will be in a set environment for the most part. If your puppy socialization class is well run then they are a nice way to meet other dog owners, and to give you and your puppy a confidence boost. But make sure that you follow the checklists yourself independently too. Once the ‘window’ for socialisation is over, your puppy will become more reserved about engaging in new activities. Working your way through the categories above will ensure that he will be able to cope with most of the normal events that life throws at him. Do keep taking him out and about and revisit some of the above scenarios occasionally. The will help to keep him confident and unafraid, and set him up for a happy life as a balanced canine citizen. You might think it doesn’t really matter if your rural Labrador is scared of trains, or a city dog is scared of cows. So why bother to go to the effort of socializing him to them? Socialization is not a simple process. It’s not a case of just exposing your dog only to those things he is likely to meet locally. It has a knock on effect. The more things your dog is exposed to during the window for socialization, the more robust he will become emotionally and the better he will cope when he does meet something new. Which he inevitably will. Poorly socialized dogs are likely to be fearful of many things, not just the ones that you don’t think matter. And what is more important, poorly socialized dogs can be dangerous. Many of our dogs are powerful animals with try strong jaws. A ten week old raw fed Labrador puppy can crunch and crush bones the thickness of your finger in less than a minute. Just think what she would be potentially capable of as an adult. Most dogs have the potential to harm people and a few have the potential to kill. Yet most dogs live among us peacefully and never bite anyone. The reason that normal healthy dogs do not bite people is because they are socialised. And the reason behind many if not most dog bites is poor socialisation. There is no doubt that the deliberate socialization experiences provided for a puppy are not the only factor in averting fearfulness in adult dogs. [wp_ad_camp_1]To some extent, natural fearfulness has been diminished in some of our domestic dog breeds through selective breeding. You cannot however assume that because you have a Labrador that you don’t need to bother to socialise him. Individuals within a breed vary greatly and the breed of a dog is an indicator rather than a guarantee of likely temperament. It is fair to say some dogs need the minimum of deliberate socialisation to grow up to be confident and friendly. Whereas other dogs need a great deal of deliberate and intense socialization in order to be great canine citizens. But you have no way of knowing which category your puppy will fall into until it’s too late. Because you can’t know what personality your puppy will grow up to have, then it’s essential that you grab the opportunity to use the puppy socialization window to the best of your abilities. It may be difficult, and it may be inconvenient to you, but you need to throw yourself into socializing your puppy from the moment he arrives in your home. Aggression in dogs is primarily triggered by fear. If we remove the fear in most cases we remove the aggression. We do not want our dogs to fear strangers, new events or different locations. We want our dogs to view the whole of the human world as their home, a place of safety. Puppy socialization helps to give you the dog you want to share your life with. A dog that has a wealth of experiences to match against new ones. Who knows that people of all shapes and sizes are not a threat, and treats the world as one big happy playground. It takes a little time and commitment, but it is worth every moment you spend on the process. 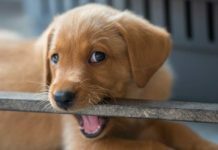 When socializing the pup in a public place, what is the solution to when my pup needs to relieve their self? 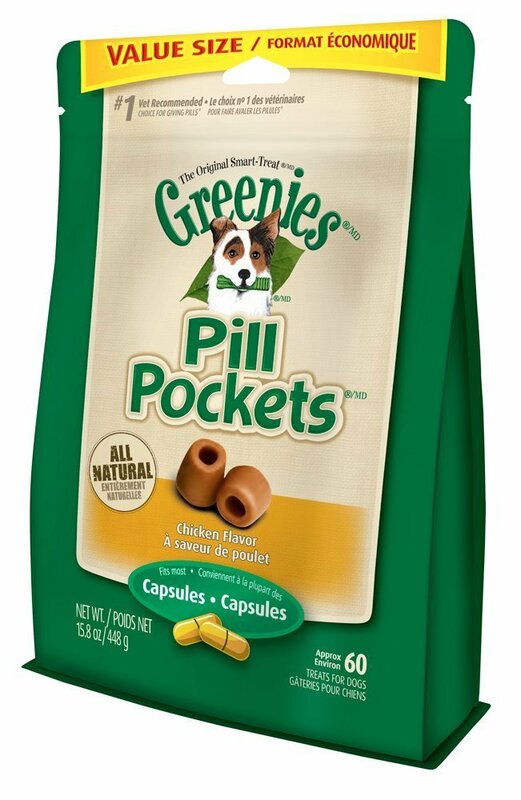 Do I hold my pup while they poop or pee or is that where I take a chance and hope she’s okay pooping and peeing in a spot? If the contacts are separated by puppy sleeps can they be counted? We got our puppy at 4 months old last week, so does that mean she’s already socialized? If so, great! She was in another foster home, and a shelter (not sure where else before that), so she saw plenty of people and dogs. She’s very sweet and friendly. I worry because we live in a somewhat-secluded area, in a small town, and we don’t get many visitors. Our last dog was kind of a head case…had a lot of anxiety. He wanted to be friendly but tended to snap and bark at people if he didn’t get to know them first. We got him when he was over a year old, too. Our puppy has barked a few times but not much. A sling is a great idea and leaves your hands free. If you carry him in it from the beginning he’ll hopefully not squirm to much when he is a bit bigger. Good luck! Hi there, i have a 16wk old chocolate lab and she has been with other dogs however, a couple of days ago we brought another pup into the house a wee golden boy. He is very loving and not near and bity as her however, they play and it seems sometimes too aggressive. I worry the female may make the wee male think this is normal? Any suggestions and should i be worried? Hi, we got a rescue puppy so I’m not sure when it was taken from her mom. She will be 5 months old 7/15. We have had her since she was about 2 1/2 months old. We have a 5 year old chocolate lab that is very gentle. But this new pup is very aggressive to my older lab, plays very rough, bites her hard and my older lab will not hurt her. How can I train her not to be so aggressive with her? I have a 8 yr old cho lab and she is very gentle but our 5 month old lab is very rough when playing, not sure how rough is normal and how do I train him to be nicer to her? Hi Maria, I will let my puppies pee in a friend’s garden provided that their own dogs are vaccinated. I wouldn’t take a small puppy out and about in an urban environment for several hours. I just make short trips to shops, station, fetes etc. It has to arranged around the puppy, rather than the puppy fitting in with you at this stage. Thank you for your quick reply Pippa. I meant taking the dog into town to look at things for the benefit of the dog not us. We live in a rural place so getting anywhere is a half hour drive anyway so I assume the dog will need to pee on arrival wherever we’re going. Hence why I wasn’t sure if it’s ok to put it down on the ground just next to the car or to let it pee on puppy pads in the car. Thanks again. I’m desperate for some advice please. I have a 9 month old boy Labrador and am looking for help with socialising and slight aggression. He barks in the garden if he sees people and if they come in the gate will bark and spring up on all fours especially the postman. this article is very useful but i wanted to ask; we got our pup at approx. 12weeks but avoided taking her anywhere really until she was vaccinated. She is now almost 20months & very good with adults/ children & inquisitive towards things she isn’t familiar with however when we walk her she is scared by loud vehicles if they are coming from behind. When we hear it coming we either turn her to face it or reassure her by talking to her as it passes. Sometimes she’s fine, others not. do you think we are taking the right approach or is there a better solution? First off your website has been a tremendous resource for us. We have a 7 month old labrador who’s afraid of going outside (especially of loud motorcycles, but also of most strangers who approach him or even just pass by). He’s more comfortable on grass where I’m thinking he feels more protected (very short bushes make a sort of a fence where he plays). While walking he would often stop, lie down, and refuse to go further, sometimes for no reason that is apparent to us at least. I was just wondering if I can socialize my puppy with most people but the people i normally like to avoid, would that cause a problem as it grows up? I baught a female lab, she is 3 n half months old, she seems to b afraid of people and outside world, though I take her out for a walk for like 1 km, she is now getting used to it, bt still very shy n scared. She doesnt listen to me at tyms n keeps pooping in the house, though for last two days she pooped outside bt again today she pooped inside our house..
How do I socialise her?? I want to b aggressive wn its required nd playful.. Wonderful advice, sensible as ever. But just to let everyone know it’s not totally disastrous if you can’t get out and about. We didn’t get our young wolfhound until he was 17 weeks old, his breeder was going to show him but he’s too big for the ring (yes, he really is that huge! ), he didn’t know about the radio or television, was terrified of a hair dryer, cars were acceptable but pushchairs were scary. With patience and help from our Labradors and lots of people we’ve gradually socialised him and although he’s never going to be the boldest boy he’s no longer a total wimp. One thing he absolutely hated was hi-vis jackets, so we borrowed one and gradually introduced it to him over the course of a month and now, although he looks a fool, he will actually wear it whilst eating his dinner and doesn’t look at them twice when he’s out and about. He’s now two and will stand stock still when he meets something new for the first time instead of turning tail and running for home. Time and patience can make up for losing that golden window.